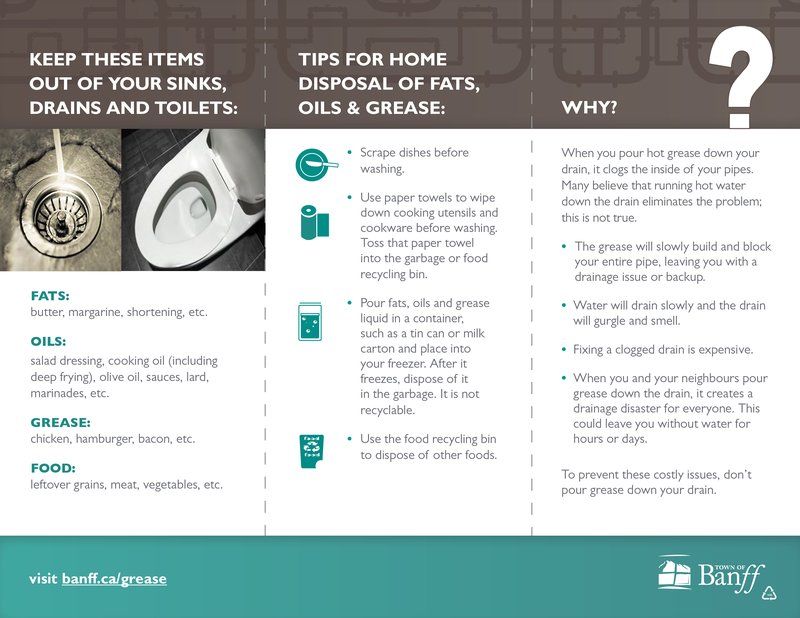 When used cooking fat, oil and grease go down the drain, it causes a lot of problems when it hardens - clogged pipes, reduced plumbing flow, odours or even sewer backups. The results can cost you or your business time and money to remedy. Fat: butter, margarine, shortening, etc. Oil: salad dressings, cooking oil (including deep frying), olive oil, sauces, lard etc. Grease: chicken, hamburgers, bacon, etc. Use a paper towel to wipe down cooking utensils and cookware before washing. Toss the paper towel in to the garbage or food recycling bin. Pour fats, oils and grease liquid in a container, like a tin can or milk carton, and place it in the freezer. After it freezes, throw it in the garbage. Food service establishments are required to own, operate and maintain a grease trap (also known as a grease interceptor) as part of the town’s Sewer Bylaw. Download this handy toolkit for food service establishments to learn how grease traps work, how to size your grease trap, and how to monitor and maintain your grease trap (with service record forms).